'Investing' Isn't Working in Today's Market. You aren't here to get sold on something. You're here because right now you can't stand to open your brokerage account statements, afraid of what you might see. You're sick of ignoring the idea that long-term investing has been an ineffective way of building wealth. Those funds you put away in hopes of improving your financial picture have instead made it worse, losing value month after month. And you're sick of the mentality that "maybe things will get better tomorrow". That's not cutting it, and you know it. From February 1999 to February 2009, the S&P 500 LOST over 40% of its value! Ouch - that's a painful decade for the stock market. That means that those who have taken on risk by investing in stocks or index-related mutual funds have on a net basis seen roughly .40 of every $1 evaporate - a far different reality than what much of Wall Street's propaganda led them to expect. That's a lost decade and a lot of money down the toilet for those who were trying to do something wise by holding stocks for the long haul. Historically, it paid off. What if another decade like that comes along and stocks decline further? The investment crowd would likely suffer a similar fate, both in terms of lost money & lost time. And yet traders would have opportunities to profit every step of the way. I don't need to tell you this, but compounding money doesn't happen overnight. If you're looking to build your nest egg into something sizeable in the future, then time is of the essence. It cannot be wasted, and it can't wait around for the economy to improve. You've got to take action, and you've got to take control. And the sooner the better. The reality is that it's now a trader's market. Those who learn to craft the skills of timing entries and exits, of proper money-management techniques, and limiting the downside when money is at risk are those who will be poised to thrive. Regardless of where the broad market goes. They are the ones who will see their net worth appreciate over time, and it WON'T be dependent upon the performance of "the market." Aren't you tired of turning on the TV and hoping - no, NEEDING - the market to go UP? The truth is that we don't ever want to be in a position where we need something to occur in order for us to benefit. What if that something doesn't happen for another decade or two? What if it doesn't ever happen? The fact of the matter is that times are tough right now, and it might take a long time for the market to recover. That means your investments could stagnate - they could struggle - for quite a while. But every day, TRADERS are jumping into the mix and finding opportunities. Will YOU be one of them? It's quite a daunting task to try to locate the next Microsoft for a long-term investment. And it involves huge risk if you're relying so heavily on that one idea to pan out. If you think that Wall Street institutions and the multi-billion dollar funds out there have access to far more information than you do, you're right. It isn't a level playing field when company-specific information is involved. The only fair game is the here-and-now, live-to-the-tick fluctuations in price which we all become aware of simultaneously as market participants. And that's exactly why traders operate in a technical manner. That approach offers much more transparency, and it's better-suited for the hit-and-run style that any Bandit must employ. Traders are able to stack up singles in rapid succession and stay agile, whereas investors are handcuffed to the long-term outcome. But have you ever been told to sell by those managing your money for you? Makes you wonder what a broker is being paid to do if all they suggest is buy and hope that price rises over time. That's why traders fire their money manager and get behind the wheel themselves. They roll over that 401k and take charge. They ditch that sorry mutual fund and get some real performance out of their money by making sure it works for them all the time - not just occasionally when the market goes up. So what's stopping you from doing the same? You're here because you don't quite understand the market, but your desire is to change that. And you've come to the right place. But You Say You Don't Know How to Trade? Trying to step across the divide between casual investor and self-directed trader can be intimidating. Sadly, that prevents many people from taking a more active role in how their money is being put to work - but it shouldn't. Trading isn't rocket science, and anyone can do it. The only problem is that it takes more time to get up to speed if you want to go it alone. TheStockBandit University was established for the very purpose of shortening your learning curve into the world of trading. I've been a full-time trader since the late 90's and I've made that transition. I'm here to share my experience with you to show you how to start getting involved. Please know that I'm not here to show you how to get rich - I'm here to educate you on trading. This course is going to take you from A to Z, from 0 to 60 in just 4 short weeks. During the course, you're going to learn about things like account types, timeframes, and why a trader takes a technical approach. I'll show you the kinds of hardware, software, tools, methods and mentality needed for trading today's markets. And we'll talk about some core concepts which will take you right to the front lines where the action is. TheStockBandit University is here to equip you to take control. Are you ready to begin? Any method of participating in the stock market involves risk - that's required for potential profits. So yes, trading does involve risk. So does conventional "investing." And actually, investing might be considered even more risky because of the longer timeframes. Putting all your eggs into one basket carries heavy risk, and it's going to be painful if that long-term idea doesn't pan out. It'll cost money, but it will also cost precious time which is needed in order to compound money. Trading can actually allow for many different ideas to flourish, eliminating that get-it-right-once mentality which many 'investors' adopt. Trading seems too complex for the Average Joe, is that true? Not at all. Today's technology has brought about far more functionality for individual traders, but it's also as easy as ever to start trading. This course is designed to cut through the fog and eliminate confusion from the process of trading so that you can get right to it whenever you're ready. It's simple, but incredibly thorough. By showing and telling you what you need to know, complex concepts are quickly converted into ordinary terms for ease of understanding. With your enrollment into TheStockBandit University's Basic Course, you can contact your course instructor for help anytime for a full-year, with any questions you might have. That direct assistance and one-on-one coaching is one huge difference that puts TheStockBandit University on a level of its own. No. This course is designed to explain core concepts even to beginning traders. No experience is required whatsoever, so if you have none that's perfectly fine. You'll still be able to follow along and learn a lot as you go through the curriculum. Do I need a brokerage account in order to take this course and follow along? No. Obviously, at some point when you do start trading, a brokerage account will be needed. However, this course isn't based upon your having a trading account open. In fact, we'll discuss some trading platforms during the course which you might want to eventually use. But no account is required for this course. Yes. You will have full, unrestricted access to all of the course lessons. That means it will continue to be a resource for you to turn to again and again. Basic course members will continue to receive personal, one-on-one assistance from the instructor during their first year of enrollment. No - simply that employing such a strategy can involve very lengthy stretches of time during which no progress will be made. Buy-and-hold is based upon the idea that prices rise over time, but prices can also fall. Someone who is counting on a stock market advance in the next few years before their retirement arrives, for example, is taking a big risk that something good will happen for their money. But if it doesn't, that time can't be replaced. Alternately, traders can seek out opportunities to profit during a variety of market conditions. So the market doesn't have to rise in order for them to profit. That's one very big advantage that trading carries over the buy-and-hold approach, which is why we think trading is a better method for consistently compounding money. Should I trade with everything I have? We are not financial advisors and cannot tell you what to do with your money. That's something only you can decide. But having said that, generally even full-time traders will trade with only a portion of their assets. That accomplishes a couple of things. First, good trading decisions can still be made when not everything is on the line. And good trading does require clear thinking. That's very difficult to do with one's entire net worth. Second, trading with a portion of one's assets can enable them to diversify timeframes. Traditional Wall Street suggests diversifying across asset classes, but they leave out the part about diversifying across timeframes. So having some short-term exposure to offset long-term exposure can often be of great benefit, particularly in a market decline such as what has occurred over the past decade. But just as 'investing' in any one idea will involve great risk, so will plowing everything you have into one trade. We do not recommend that. TheStockBandit University is a training course which is laid out over a 4-week period through a "virtual classroom" format. That sounds exciting, but what does it mean? Well, it means you're going to be able to move at your own pace right in the comfort of your own home (or office, hotel room, etc.). There is no time requirement of you, no need for additional materials in order to complete the course. Just you and your instructor, 24/7. You just sign in to the member area, and instantly start to access the step-by-step video-based lessons that show you everything you need to know to start trading. It's so simple that you can do it in your spare time over the course of the next 4 weeks. And even better, you'll still have access to them for an entire year. That's a fantastic resource you'll have right at your fingertips to refer to over and over. Oh, and just because you're in a virtual classroom doesn't mean you can't ask questions. With your enrollment in our Basic Course, you'll be able to contact your instructor for expert guidance whenever you want - just a mouse click away. Week 1 - The lessons in the first week lay the groundwork for what comes later in the course. You'll quickly realize that you've stumbled onto a goldmine of useful info. You'll also learn some key distinctions between trading and investing, and we'll go over the nuts and bolts of trading so that you can start putting it to use right away. Week 2 - This is when you start going deeper with your understanding of trading, and you'll quickly build your knowledge base for finding trades. You'll learn to gauge which stocks are poised for strength or weakness, as well as gain some valuable trade management tactics so that getting out of trades is a breeze. Week 3 - During the 3rd week of the course, you'll learn how to develop a trading plan. You'll understand trading psychology and what it can mean to your bottom line as a trader. You'll find that this segment is as valuable as any other portion of the course as you learn how to win & how to lose the right way for success. Week 4 - As you near completion of the course, you're going to be given some unique resources and crucial instructions when it comes to getting & staying on track with your trading. We'll talk about organization, accounting, and goal setting for your trading so that you can keep close tabs on your progress going forward. The concept of long-term investing for many has turned into something that just might last a lifetime - but without the results. Relinquishing control of your money for someone else to manage has brought about plenty of disappointment and frustration if your returns mimic the overall market in recent years. What happened to those graphs pointing up and to the right? You're now facing a crossroads. And you're wondering, might it be more fun & rewarding to take the wheel and know you're being proactive in finding a better way? Well, just dumping money into an account and hoping that it multiplies over time is a nifty concept, but let's talk in terms of reality. The fact of the matter is that the market has been sliding. Not climbing. And there is no certainty that's going to change anytime soon. All the while, the clock keeps ticking. Are you making any progress, or are you losing ground? The stock market has historically risen over time, but inevitably there are extended stretches of time when the market stagnates or declines substantially, leaving your money at risk without reward. Like the past decade. Traditional Wall Street doesn't want you to know how to move your money into and out of stocks, so they encourage you to "stay invested" at all times. But that just doesn't cut it for most. Don't you want your money to work harder for you than that? Think of it this way... If your money were an employee, would you be satisfied with it spending up to 2/3 of the time sitting idle and accomplishing nothing for you? Any smart business owner would fire that employee ASAP. And you ARE a business owner, because your money - your trading capital - has the ability to produce consistent profits for you. It's an asset just like a business. But it must be put to work. If you learn how to move your money wisely, like a business, you can have it working for you during the best times and protect your cash during the worst times, ending up miles ahead of where you might have been otherwise. Why would anyone want to endure the declines? It defies logic, and yet so many have been brainwashed into that mindset. Today's markets reward TRADERS, because there is a huge range of emotions at play every day. Feelings like fear and anxiety are driving the decisions of those who are at the mercy of the market as stock holders, and it isn't paying off for them. It's catering to those who are NOT stuck holders. Not everyone wants to take responsibility for their financial future. Many people would rather pass it off on someone else, claiming success as their own (if it happens) and yet still being able to place blame elsewhere if not. That's a loser's mentality, and it'll get you nowhere if you accept it. This course isn't able to overcome that attitude. But for those who want to step up and break through the barrier that Wall Street literature has built, a better choice exists. For those who are willing to spend some extra time learning to think outside the box, a world of opportunity awaits. They know that a short-term commitment to learning just might mean the night-and-day difference for them between failure and lasting success. Learning a new craft doesn't happen overnight, and yet it has potential to provide for years to come. TheStockBandit University is here to offer you a different approach - one that enables you to get off the sidelines and into the game. It's an approach which, if done well, can allow you to succeed in any market environment. Bull markets, bear markets, or range-bound markets - all 3 of them hold tremendous opportunities for traders, but only one of them favors the long-term investor. So would you rather invest, or TRADE? Are you ready to fire your broker? Are you ready to roll over that 401k and take charge? Are you ready to ditch that sorry mutual fund and get some real performance out of your money by making sure it works for you all the time - not just on occasion when the market goes up? The fact of the matter is that times are tough right now, and it might take a long time for the market to get back on the road to recovery. It could get even worse. That means your investments could stagnate - they could struggle - for years. But every day, TRADERS are jumping into the mix and finding opportunities. Will you be one of them? TheStockBandit University makes learning easy, and it doesn't require a cross-country trek to get to some cramped hotel meeting room. Through this course, you can learn as you go, in the comfort of your own home - and you can begin RIGHT NOW. Enrolling in the course gives you instant access to the lessons, granting you immediate permission to start learning the things that traditional Wall Street doesn't want you to know! And you can do it risk-free! TheStockBandit University is so thorough, so complete, and so informative that it's being offered to you with a 100% no-questions-asked money-back guarantee. If you enroll in the course for the first time and find that it's not what you were looking for, you can ask for and receive a full refund within the first 7 days. I'm that confident you're going to love it. TheStockBandit University is your answer. Here at TheStockBandit University, we aren't looking to sell you a get-rich-quick scheme for making money in the stock market. We're here to educate you - to bring your knowledge up to speed - so that you can begin to become the kind of trader which suits you best. If beyond that point you want to get rich quick, that'll be your decision! So, how can you learn here? If you wanted to get good at something, you'd want to learn from an expert. By finding an expert, you're shortening your learning curve by letting their mistakes work for YOU. Navigating a maze would be easier if someone else who has been down several paths could tell you what to avoid, right? Well, trading the stock market can feel like a maze sometimes, and we want to help you understand the tools and knowledge you'll need in order to start walking through it successfully. We're here to equip you to become a trader, bringing you through the fog to the front lines of trading where the action and the opportunity are greatest. We'll accelerate your learning curve and strengthen your skill set so that you can start add some weapons to your arsenal, and get one giant step closer to the dream. 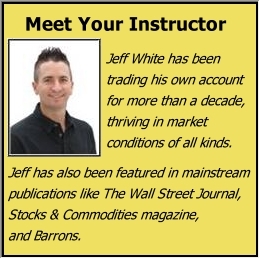 At the end of this course, you'll recognize tradable patterns, identify situations clearly, understand the lingo, be equipped to select your own trades and get on the road to success, carry on conversations in forums/message boards, and much more. You'll have overcome the fears that are currently preventing you from taking a more active role in the markets, taking your confidence to a new level as you become a self-directed trader making your own decisions with your money. This course is unlike anything you've seen before. Self-directed traders don't need the market to go higher. Traders don't care which way the market goes, because there are opportunities to profit in every direction. Today's markets are highly volatile with extreme uncertainty, and they cater to the flexible. Those stagnant, long-term strategies your father used just aren't being rewarded, and it's time to make a change if you want better results than you're getting. It's time to stop being driven by frustration and fear, and start being driven by confidence. It's time to be proactive. A trader understands risk & reward, and makes decisions based on those factors. Profitability isn't subject to market performance, which is a huge relief! This course is not designed to show you what to trade or tell you when to make trades. This is not an advisory service, and this course is not here to proclaim outrageous performance statistics or make you rich overnight. This course is a stepping stone to take you beyond the ranks of the struggling buy-and-hope crowd, to an educated and prepared individual who is equipped and ready to trade. The ball is in your court, and you're facing a decision which could make a tremendous difference in your future. Right about now, you're asking yourself, "what am I waiting for, and what have I got to lose?" Get over that hump of uncertainty and take action - you'll be glad you did. If you're ready to cross the threshold to enter the trading arena and embrace all the possibilities it brings with it, then enroll now for instant access to the course lessons. You'll immediately be able to start learning - all you need to do is register below. Click the Enroll Now link and start the process. You'll select a login, complete the registration, and be on your way to leaving the market-dependent investment mentality in your rearview mirror. Pretty soon, you'll Trade Like A Bandit! Yes! I Want To Enroll in TheStockBandit University! I understand and have read all your Terms of Service, Disclaimer, and I would like to enroll in this program. I understand the cost of the Basic Course is $397. I understand this is a 4-week course and that I'll receive access to the lessons one week at a time until all have been released. Upon enrollment, I'll select my login and instantly have access to the first week of lessons. I understand that my access to the instructor will last for one full year. 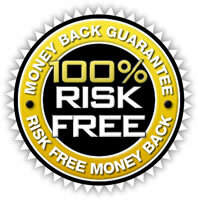 I understand I have a money-back guarantee without risk. If during the first 7 days I am not fully-satisfied with what I'm learning and would like a refund issued to me, I may request one and get it. And I understand this offer applies to first-time registration only. Under these conditions, please accept my order NOW! You receive everything listed above, as well as the ability to communicate directly with your instructor for personal assistance. You receive access to BOTH the Basic & Advanced Courses, as well as the ability to communicate directly with your instructor for personal assistance.